Today’s construction companies are always looking for ways to reduce their footprints on the environment, and they’re doing so for a variety of reasons. Whether it’s because they’re seeking Leadership in Energy and Environmental Design (LEED) certification on a project, trying to lower their overall carbon emissions or simply aiming to be a better corporate citizen, companies are paying more attention to their impact on the planet. One of the areas where there’s lots of room for improvement is on the work site itself. From waste diversion to protecting natural habitats to minimizing pollution, there are many factors that come into play to create a work site that’s better for the environment. “Certainly the biggest impact is construction waste,” says Manasc. “There’s a lot that can be done around separating waste at source.” The Canada Green Building Council, which administers the LEED program in Canada, estimates that 35 per cent of landfill waste in the country comes from construction and demolition activities. In Alberta, the most recent estimates put that number at about 20 to 25 per cent. While many municipalities have recycling options, not all companies take advantage of them. For instance, the C&D Facility at the Edmonton Waste Management Centre, which opened in 2012, can process up to 100,000 tonnes of material per year, including wood, concrete, asphalt, drywall, metal, roofing materials and cardboard. You can bring in segregated loads, where you can separate the material yourself for reduced rates, or you can bring in mixed loads and let the facility do the sorting for you. In Calgary, all three City-owned landfills collect construction materials for third-party companies to recycle. Calgary is also home to ECCO Recycling and Energy Corporation, which operates North America’s largest material recycling facility, which collects and processes wood, asphalt shingles, scrap metal, cardboard, paper, plastics, drywall and aggregates like concrete and gravel. Other considerations include how sites affect their immediate environments – “Everything from mud on the street to how much runoff there is from sites to erosion sedimentation … to how noise is managed on the site and how materials are moved in and out of the site,” says Manasc. “In the long term, there are considerations in terms of the actual building materials that are used,” she adds. In the past few years, a lot of research has been done to create a “red list” of building materials that are toxic to human health. Marc Breault, president of St. Albert-based Paradox Access Solutions, points to new technologies as a way to improve your environmental performance. “Back in 2004, I started this company in my basement, and one of the things that I saw was this need for educating the industry on how you can [have a successful business] without destroying the earth.” Since then, he has pioneered environmentally friendly ways to build access points to various sites for the oil and gas and construction industries. By using a product called Tough Cell (formerly PRS Neoweb), the company can stabilize and reinforce the soil on a construction site. The product forms a 3D honeycomb-like matrix that is then infilled with free-draining aggregates like ­r­ecycled concrete, sand or gravel and allows workers and machinery to access sites year-round. “Basically, if you’re constructing a building, driving around the building and being knee-deep in mud – and your employees are slogging around in mud – sometimes even the project gets shut down. We build an environment around their project where it’s all-access year-round, rain or shine,” he says, adding that the product works in temperature extremes ranging from – 60°C to 60°C. It also allows contractors to build floating roads on top of wetlands areas without introducing any new species or soil that would cross-contaminate the environment. The product provides for less wear and tear on equipment and better fuel efficiency because machinery is not being slogged around in the mud – which is also beneficial for the environment. But do these kinds of green technologies increase costs? Breault says this type of innovation actually reduces costs and improves productivity. “Deliveries show up on time and employees are there all the time and they have entire access to the project,” he notes. While these may be only a few of the measures that companies can take to reduce their footprint on the earth, they are part of an attitude shift that is taking place across the industry. “You have to think about the safety of the planet in the same way as you think about the safety of the people on the planet,” says Manasc. Separate your construction waste at the source. Landfills and recycling facilities usually either require this to be done before accepting materials or will charge less for segregated loads. Dedicate time at the end of each work day to cleaning up, so that workers understand it’s part of the job and they don’t feel like they are doing more than a day’s work. Make sure you’ve planned your project properly to reduce waste. Use standard lengths for things like wiring, pipes, ducting and siding. Plan ceiling heights and roofs in two-foot increments. 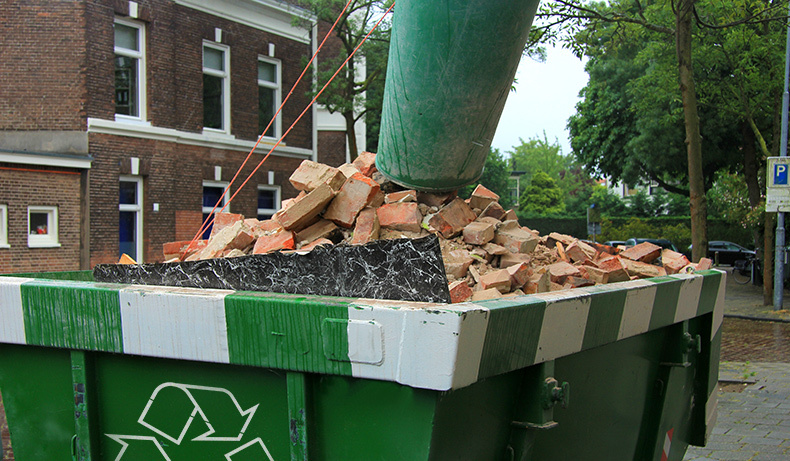 Start a reuse pile on the site, collecting materials that can be used for smaller jobs. Scrap lumber can be saved for use as shims or patches. Used items that are being replaced can be saved from the landfill by being sold online or donated to Habitat for Humanity’s ReStore if they’re still in good condition. Do regular inventories of building materials on site to reduce the number of trips to the hardware store, which can cost time and money, as well as carbon emissions from vehicles. Have a secure, weatherproof area on site where building materials can be stored. Not having to replace materials due to theft or weather damage saves money and time as well as reducing waste. Any unused items can be returned to stores for refunds.